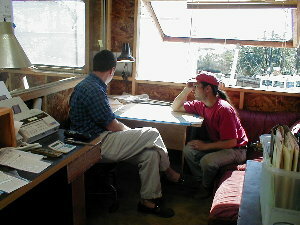 February 14, 2001 As Fat Tuesday approaches, the big blowout of feasting and indulgence before renunciation, the Cherokee crew pushes on with their own project of transformation and renewal. 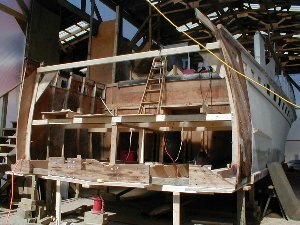 Soon this high and dry composite of wood, nails, and glue will once again be greater than the sum of her parts, and will know the “zest of swift passage, the rest of quiet anchorage, and a new world everyday as the horizon beckons,” as Vincent Gilpin so nicely wrote in The Good Little Ship. The sawdust is flying within the facility! 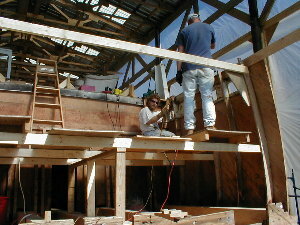 Tom and Leonard have built a scaffolding floor in the stern of the boat to facilitate repair. 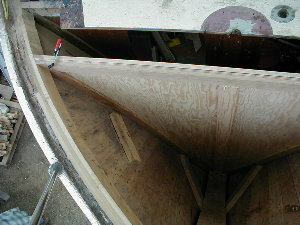 Since removing the transom and deck, they’ve installed and lengthened both sheer clamps and both bottom chines. 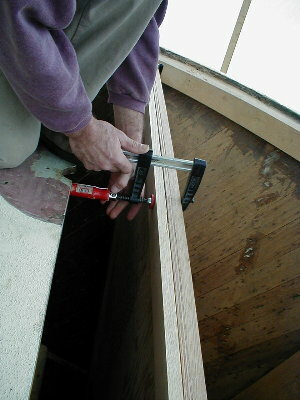 Tom is working on the laminated transom sheer clamp, which will temporarily get glued to a jig to hold its shape. “We will glue no wood before it’s time,” Leonard explained to Casey. 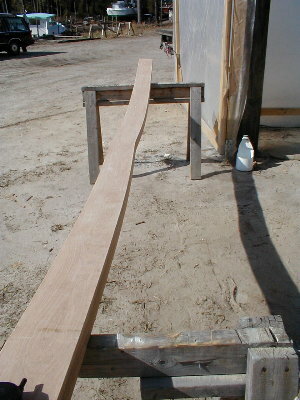 Leonard and Tom also made the lower transom frame, a curving laminated piece that will follow the deadrise of the bottom and the curve of the transom. These carved frames are normally referred to as “fashion pieces”. 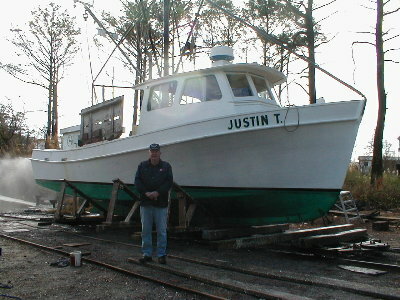 John Stein is working on the fabrication of the anchor locker bulkhead. 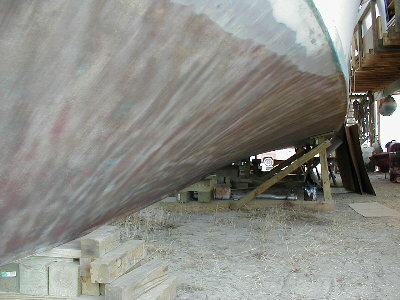 He has dry fit the bulkhead in place, and is ready to begin permanent installation. Meanwhile, Robbin is working in the watertank room – removing stringers and brackets for resetting and digging out rot in frames. She has built new frames for the tank room, including scarfs, plywood sister pieces, and gussets, all of which will be installed this week. 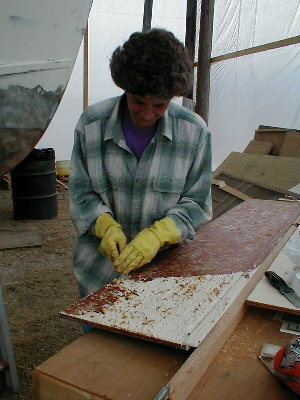 Jeanette is sanding and scraping closet doors, window trim, and drawers. For the closet doors, she found it necessary to use chemical paint stripper.